Fathers 4 Justice® works for the end of discrimination against our children and their parents in family court and elsewhere. Fathers 4 Justice® exposes and confronts the corruption which runs rampant in today’s ANTI-family court system which openly abuses our children, their parents and grandparents. Yes, we believe Parental Alienation is an act of child abuse. Fathers 4 Justice® is organized exclusively for charitable and educational purposes and the prevention of cruelty to children. Fathers 4 Justice® uses non violent direct action campaigns done with humor to enlighten the masses of our children’s issues. Fathers 4 Justice® delivers the message that the corruption and discrimination currently found in our family and juvenile courts will no longer be tolerated. Fathers 4 Justice® believes that children of divorce or separation deserve the right to be raised equally by BOTH parents. Fathers 4 Justice® is fighting for truth, justice and equality in family law. 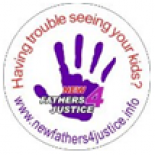 The name is “Fathers 4 Justice” but make no mistake, our campaign is for our children’s rights! 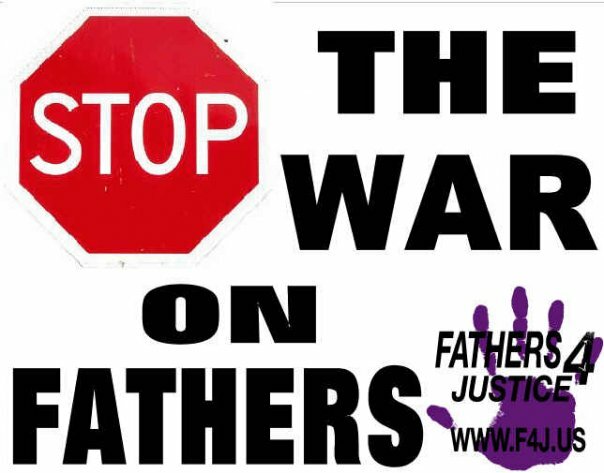 Fathers-4-Justice® US (F4J®) is a 501(c)(3) not-for-profit, volunteer army of fathers, mothers, grandparents, and others dedicated to fighting for truth, justice and equality in family law. The F4J® army is building and now is the time for you to join our ranks in the name of protecting America’s children from the abuse they suffer in the family court system! What will you tell your child when they ask What did you do in the war on corrupt family courts? F4J® knows that every parent is a superhero in the eyes of a child. F4J® also believes that it takes “superhero powers” to fight the corruption in America’s family courts. To that end, superhero parents in costumes as Superman, Superwoman, Spiderman, Batman and other childhood superhero favorites are frequently found leading the F4J® US troops at rallies, demonstrations, and other events to bring much needed humor and media attention to its cause. F4J® merchandise , such as F4J® branded tee shirts are designed to make a positive impression in courtrooms and elsewhere. Fathers-4-Justice® understands that fathers, mothers and grandparents across America have suffered because of an unjust family court system. However, statistics clearly indicate that fathers and their children have taken the greatest abuse from this unjust and intolerable system, which is why we created FATHERS-4-Justice® US. Anyone who supports equality in family courts is welcome in our organization. We do not favor sole custody by either parent when both parents are fit. We believe that children of divorce or separation deserve the right to be raised equally by BOTH parents. Asking for justice hasn’t worked for more than 30 years, It is time to DEMAND it! JOIN NOW! We need your support. Fathers-4-Justice® US is a federally recognized 501(c)(3) organization, so all memberships and financial contributions are 100% tax-deductible. Fathers-4-Justice® (F4J®) is a civil rights campaign organization that employs a multi-pronged approach for spreading its message across the United States Using direct action done with humor, our message is that the bias and discrimination currently found in our family courts and family law will no longer be tolerated. Our primary method of campaigning is accomplished through the use of high profile and unique demonstrations done with humor to focus media attention on a specific issue, or a public official, that is not supportive of truth, justice and equality in family law and the family courts. We are the “feet on the streets”, shouting our demands for equality at the very courthouse and legislature doors where justice is being denied. Other campaign methods also include meeting with officials to express our strong concerns, letter writing, television and radio ads, billboards and participation in parades and other high profile public events. We believe in the methods and actions taken by history’s great civil rights leaders, such as Martin Luther King Jr. and Mahatma Gandhi, to ensure that a collective voice is heard. The national organization cannot provide individual help.